All last week I was expecting to go out to the garden to see part of the fence collapsed or a big hole in it. But the good news is that it’s still doing it’s job. No signs of four legged visitors disrupting the soil. I can relax and just enjoy taking care of the garden. I did get a question last week on how I was going to get in and out of my garden with new fence installed. I answered that I would use a step stool to get in. When asked what about getting back out, I stared blankly for a few seconds because I didn’t have a good answer. I probably should’ve developed a solution for that dilemma. 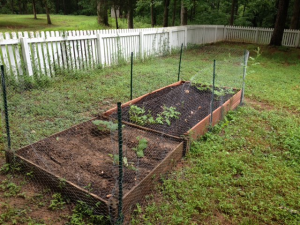 On the bright side, I did some weeding this week and could lean far enough over the top of the fence to get it done. 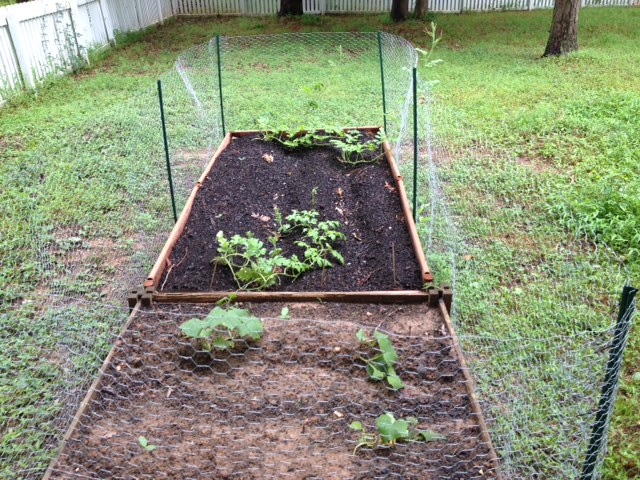 There are some space between the rows so I can get in there if I need to and avoid trampling the plants. 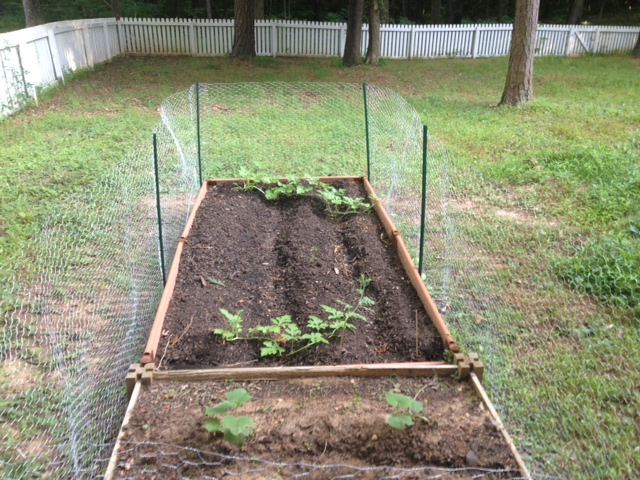 To report on the current state of my garden: The two watermelon plants I planted last month are doing very well. The vines are starting to take over. I planted two more and they’re starting to bud. I have three cucumber plants which are getting bigger every day. I planted two more and those are popping up as well. I haven’t seen any pepper or carrot seedlings yet though. I’m hoping those appear this week since I planted those at the beginning of the month. We’ve gotten several days of good soaking rain this week, so watering on my part was at a minimum. Overall, a good week in the garden! Pictures of my garden as of July 20 below. I finally finished the fence around the garden a couple of days ago. I haven’t noticed any animal related activity in the garden since then. I’m keeping my fingers crossed that this holds true and the fence holds up. The only bad thing is that the fence is about belly button high. I’m going to have to either figure out how to high jump over the top or use a step stool to get in there. I thought about building a gate into the fence but I read that could be a weak point and become a point of entry for pests. I figure if I have a hard time getting in, the critters will too. 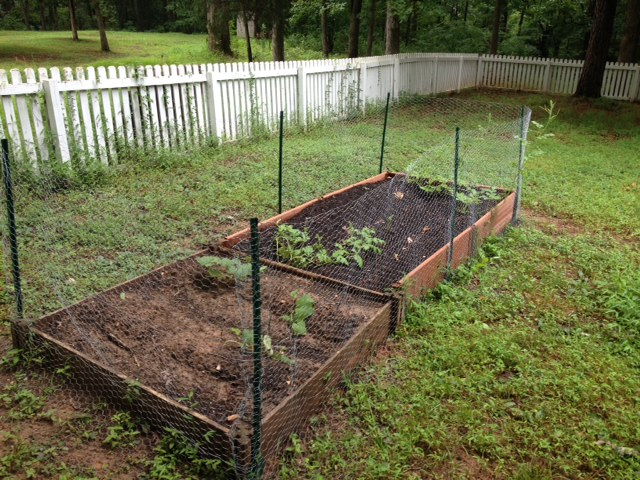 Now that my garden has a defense from pests, I went ahead and planted more seeds. I currently only have two watermelon plants and three cucumber plants that are doing well. 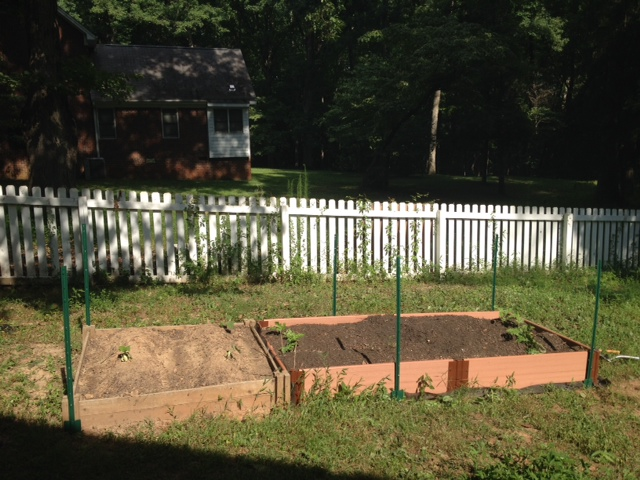 I planted more watermelon and cucumber and also carrots and red peppers. I’m choosing to remain optimistic and look forward to a bounty of fresh fruits and veggies in the next several weeks. 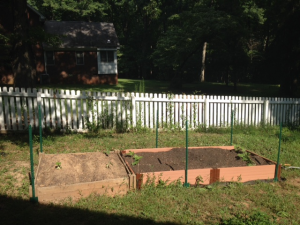 My next steps are to add fertilizer to the garden to boost growth and continue watering daily. Before we hit the summer heat, I was only watering every other day. Between daily watering and the multiple rainstorms we had last week, I’ve noticed a big difference. 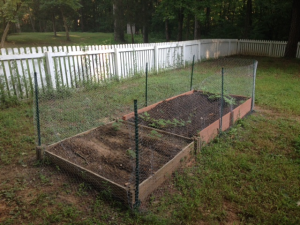 I admit I got pretty down about the state of the garden after the week of neglect. I thought about quitting and just trying again next year. But I’m pushing forward so we’ll see what happens. With the World Cup finally over, I’ll have fewer distractions. And fewer things to blame when I screw up. 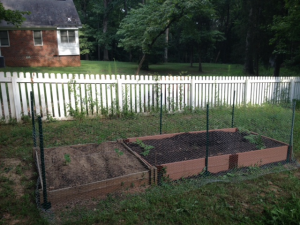 Take a look at the current state of the garden below. Okay, after last week’s disaster, I’m back on track. No more neglecting the garden. I’ve been on top with watering and weeding. 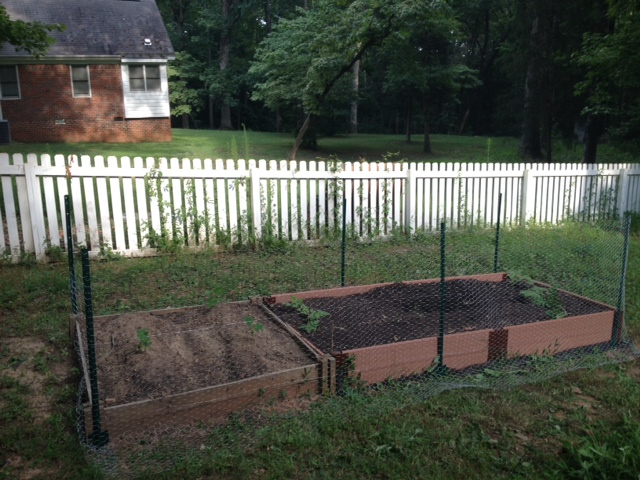 I would’ve planted more seeds, but I figured that was pointless until I got the fence up. Off to the local big box hardware store for supplies. I decided to use metal stakes and chicken wire about three feet high. I watched this video on how to build a fence. He used a sturdier material but I’m hoping the chicken wire will be strong enough. I’m glad I watched the video because my first thought was to dig a few foot deep holes around the garden, insert posts and hook the fence between them. The guy in this video hooked the fence between the stakes and curved the fence at the bottom so animals couldn’t dig under. He then staked the fence along the ground. This seemed like the easier option, so of course I went with it. I started by hammering the stakes into the ground with a mallet. One of the posts required digging out rocks underneath the surface. Once those were out of the way, no more problems. The other posts went in pretty easily. I put four posts around the corners and two in the middle. Should I have measured to make sure the posts were equidistant? Yes. Did I? No. I know, I know. If I’m going to do something I should make sure I do it right. But this was after mowing part of the backyard and most of the front. It probably wasn’t the smartest thing to do on a nearly 90 degree day but no one’s ever mistaken me for a genius. Next, I strung the chicken wire between the posts. 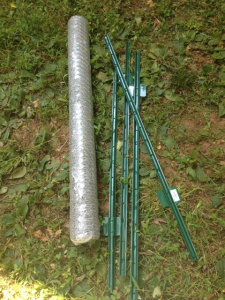 The posts had handy notches on them where I could hook the chicken wire into. I was pretty pleased with how the first side looked. 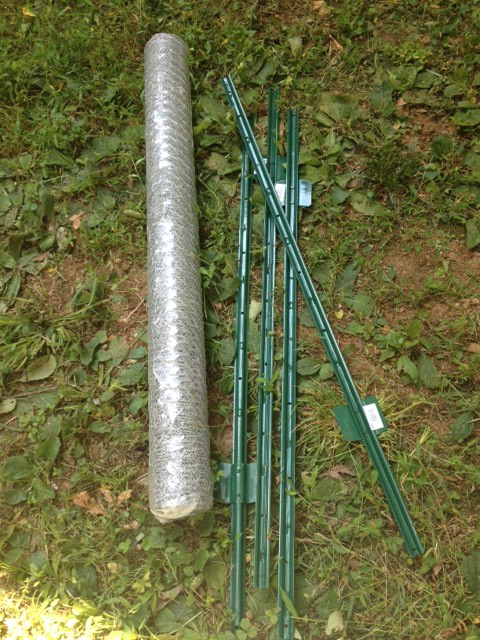 Then I realized that I didn’t have stakes to root the chicken wire to the ground or zip ties to make sure the chicken wire stayed tight against the posts. Back to the home improvement store. But on another day. I was quite tired from all the yard work so I’ll have to finish later in the week. But take a look below! I think the fence looks pretty good so far.